Gerhard Ens was born on August 4, 1922 in the village of Gnadenthal in present-day Ukraine. He was the eldest son of Gerhard Ens and Helena Sawatzky. Before he was one year old, his family migrated to Canada and settled in the village of Reinland, Manitoba where he went to school until grade eight. He completed his village schooling in nearby Gnadenthal, where he lived with his grandmother Sawatzky. These two years turned out to be among the most decisive in his life, as he came under the influence of Mr. P. J. Schaefer – his teacher and future mentor. After grade 10, Gerhard attended the MCI in Gretna for his remaining two years of high school. He was admitted to Normal School in Winnipeg in September of 1941, and a year later he began teaching in Gnadenthal under the principalship of Mr. Schaefer. In the middle of his first year of teaching he was called up for military service. 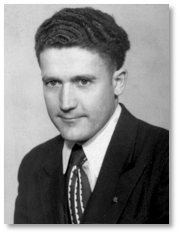 He was granted status as a conscientious objector, but as a consequence, his teaching certificate was revoked, and so he performed alternative service for the balance of the war. After the war, he was offered a job teaching at the MCI in Gretna where a teaching certificate was not required. He stayed at the MCI for the next thirty years – the last nine as principal. He believed that God had led him to teach at the MCI, and he had a lasting impact on the school and on many of his students. While attending summer school at the University of Manitoba in 1948, he met and fell in love with Anni Niebuhr, a recent immigrant from the Soviet Union, and they were married in Reinland in 1950. In their 60 years of marriage they raised 5 children and 10 grandchildren. 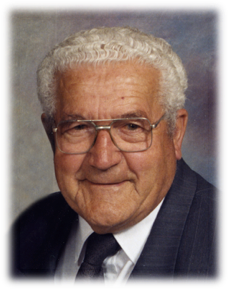 Besides teaching, studying, and parenting, Gerhard contributed extensively to Mennonite culture. He was baptized in 1946, ordained in 1958, and was a lay minister at the Blumenorter Mennonite Church for many years. In 1957, he was a founding member of the Mennonite Historical Society, which established the Mennonite Heritage Village museum in Steinbach. He served on the board for 50 years, acting as its president until 1998. During the preparations for the Manitoba Mennonite centennial celebrations in 1974, he began producing a weekly half-hour broadcast in Low German on topics related to Mennonite history. The program ran for 30 years until 2005, and maintained a loyal audience throughout. Gerhard also served as secretary of the Manitoba Conference of Mennonites, and was on its education committee for many years, writing German Sunday School lessons used in churches throughout America. After retiring from the MCI in 1977, Gerhard and Anni moved to Winnipeg, where until 1994, Gerhard was the editor of Der Bote – a German language newspaper. Anni and Gerhard joined Sargent Avenue Mennonite Church, where Gerhard served as lay minister and leader of the German Bible Study for 25 years. In 2008, when Anni could no longer care for him, Gerhard was admitted to Donwood Manor Personal Care Home where he received daily visits from his wife and family. Gerhard was first of all a teacher, a man of conviction and integrity, a man who freely shared his scholarship, his insight, his dedication, and his faith. His sense of humour, his willingness to become involved in the lives of students, and his warm humanity have touched the lives of many people. Gerhard Ens passed away at the age of 88 on Sunday, February 13, 2011. His memory is held dear by his wife and family; siblings and in-laws Betty Ens, Sara Ens, Bill Penner, Helen Ens, Abe and Helen Ens, Adolf and Anna Ens, Mary-Anne Zacharias, Werner and Marlene Ens, and Armin and Caroline Ens and their families. He was predeceased by his parents, Gerhard and Helena Ens, brothers Frank, Henry, and Ernst, sister Margaret Penner, sister-in-law Jean, son-in-law Dietmar, and brother-in-law Frank Zacharias.